It’s no secret that a lot highly questionable things have been known to go down at Walmart. Whether it’s the strange items that are for sale or the customers who are buying them, there’s never a dull moment in or around a Walmart. Check out some of the craziest things ever captured at a Walmart, including some really questionable parenting techniques. Did you know that Walmart has an employee choir? 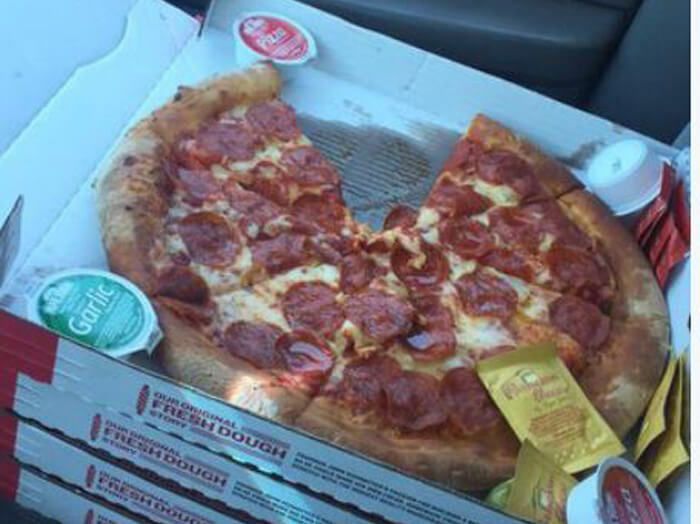 @HecksNawBro ran to grab something at Walmart and left his pizza unattended in his vehicle. Of course, the window was open just enough for somebody to reach in and snag a slice. Although we feel bad that this happened, you really should know better than to leave some fresh pizza by itself in the parking lot of a Walmart. Those parking lots are a war zone. We also think that @HecksNawBro should count their blessings that the perp just took one slice when they easily could have taken everything if they wanted. It’s also surprising that they didn’t open any of the ranch or seasoning packets.